The realtime deembedding of signal path characteristics is based on S-parameters. Users benefit from highest acquisition speed even with activated realtime deembedding and precise triggering on compensated signal events up to the full instrument bandwidth. Traditional deembedding capabilities are extended with flexible filter structures directly after the A/D converters. 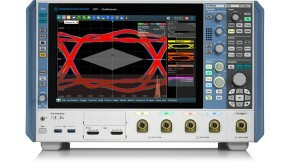 This allows waveform correction in realtime. 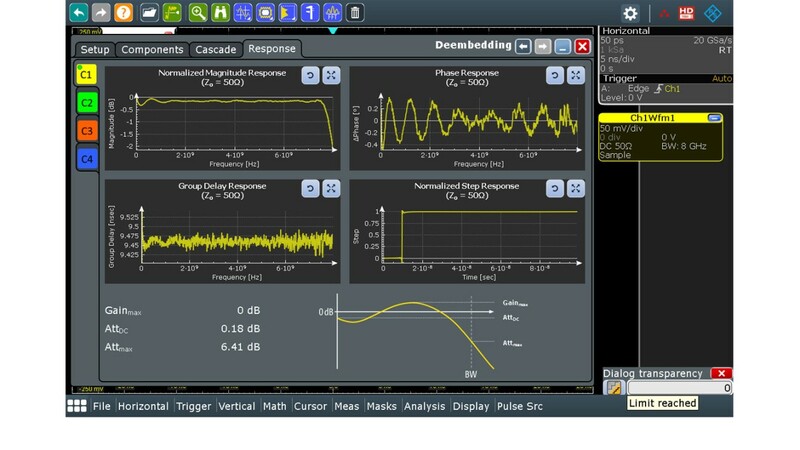 The advantages over deembedding the acquired waveform during postprocessing are the measurement speed and instrument responsiveness. In addition, triggering on corrected waveforms is possible. A cascade of signal path blocks can be defined for deembedding. The individual blocks are described by S-parameters that can be derived from simulation or measured with a vector network analyzer. 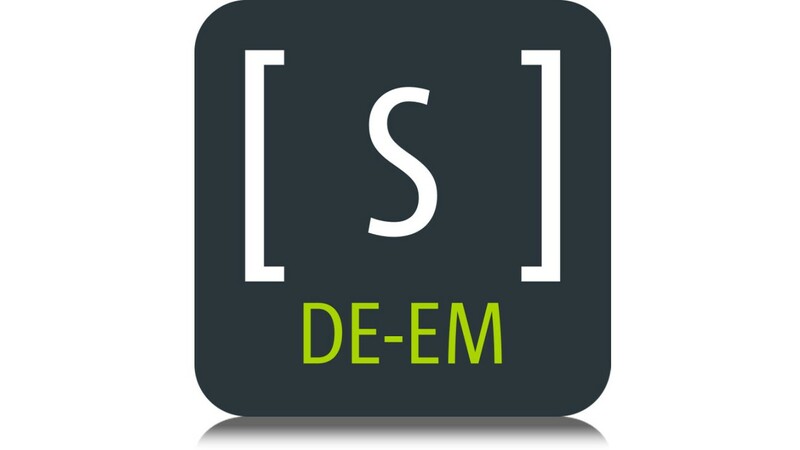 The deembedding software automatically calculates the correction filter for the overall system response. 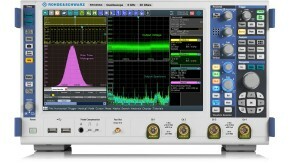 Users can trigger on corrected waveforms and focus on debugging the true device characteristics. The unique digital trigger system operates with the sampling points of the A/D converter and the realtime deembedding filters. 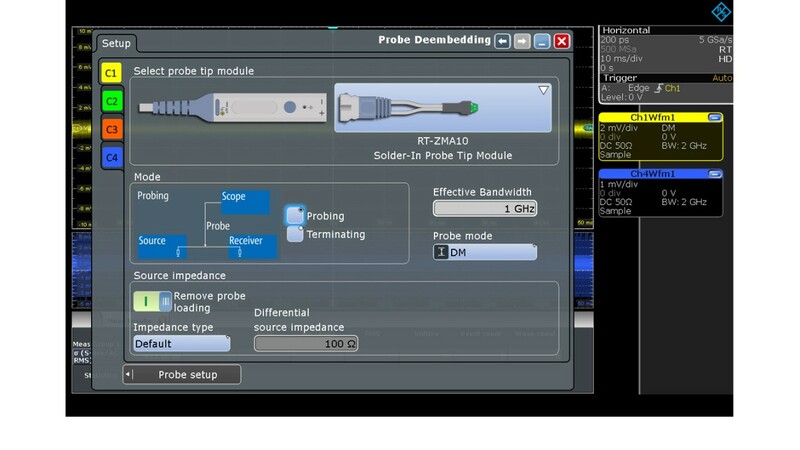 The trigger evaluates the real device signal since the distortion effects of the measurement path have been removed. In addition to the edge trigger, advanced trigger types such as pulse width, runt and setup & hold work up to the full bandwidth of the R&S®RTP. This enables fast isolation of high-frequency signal components. The trigger sensitivity is adjustable from 0 to 5 div and the trigger resolution can be extended up to 16-bit with the high definition mode. Users can reliably trigger on even the smallest signal details.